Do you ever have a brilliant idea ... only to find that the execution is completely flawed? Its Bargy's 4th birthday this week and as is customary, we needed to make a little something for his kindergarten classmates. My smashing idea was to colour ready-to-roll fondant (white) icing, before cutting out simple decorations for cupcakes. 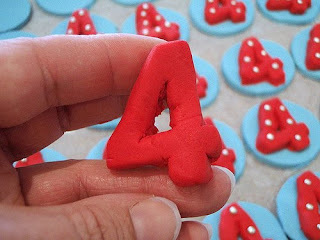 I rifled through the playdough cutters and got to work on cutting out blue circles and two dozen red fours. It wasn't until I'd embarked on this venture and passed the point of no return (read: coloured half a kilo of icing in an alarming shade of carmine), that I realised there was a problem. Yup. The triangles. 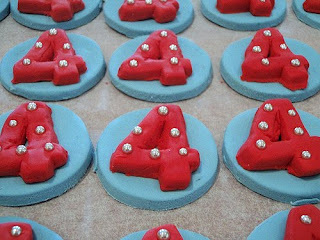 Can you guess how tricky removing the middles from two dozen fours is? 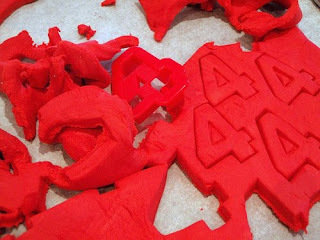 Four crying out loud: please always check your playdough cutter font before getting started. This has been a community service announcement. I think the class will be suitably impressed. Any complaints can be directed to the cutters and left over icing - see if they can do better! They look fabulous. I only have one problem with all your fabulous cakeyness - you have to keep outdoing yourself every year! If you raise the bar any higher by the time the boys get married you'll be making the Taj Mahal out of spun sugar for a wedding cake!?! 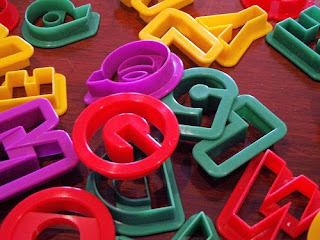 Thank goodness for play-do cutters.... imagine all the trouble you'd have to go to to find a number 4 cutter at the shops. I think you definitely have the right to make a complaint to the manufacturer about the dodgy triangle bit though. They look good to me! If anyone complains tell them they have to repeat kindy. check your playdough cutter font, love it! i am sure those kids would have been too high on sugar icing to even care. Totally perfect, and as the kids only ever eat the icing, they would be totally eaten up. ... and happy birthday Bargy! Hope you're having a wonderful day today.